Richard Earp at Fraser Yachts gives me the go ahead to report a €245,000 price cut on the 24m Navetta motor yacht Phaedra I, a joint listing with Filip Jerolinov at Cape4 Yachting. Built by Benetti Sail Division in 2002, Phaedra I accommodates up to eight guests in three staterooms and twin 379hp MAN engines power her to 10 knots. 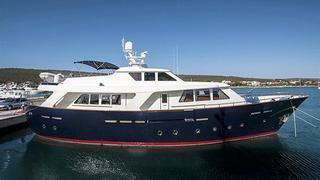 Lying in Zadar, Croatia, Phaedra I is down from €2,195,000 to €1,950,000.